Henry was famous for mapping the Hudson River and the North Atlantic. Henry's crew was mad at him for traveling to another country and kicked him and a few of his follows off of the ship. 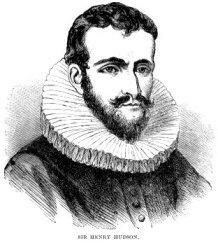 Hudson was born in the 1560's or 70's somewhere in England near London. His early family life was most likely wealthy. His grandfather owned a trading company to make the family wealthy family. He was looking for a Northern Passage. An ice-free voyage to Asia. Hudson explored in 1609 to 1611. He got to Russia, Greenland, and others before he had to turn back. Henry explored the New York Harbor and went up a river now called the Hudson River. Henry and his crew used a boat or ship as transportation. Henry supposedly died in 1611 or 1612 in Hudson Bay, North America. It is said he died from starvation or he froze to death but it is not conformed. This is where and when Henry Hudson had may have died, but know one knows for sure. Kids learn about the biography and life of explorer Henry Hudson. Explored North America searching for the Northwest Passage.